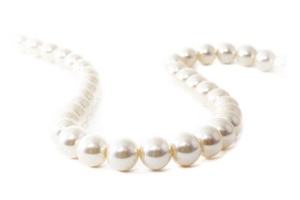 Cultured pearls are often strung on silk thread with a knot between each pearl. This keeps the pearls from rubbing against each other and prevents all the pearls from cascading to the floor if the necklace was to break. Silk thread is susceptible to wear and tear, especially if you wear the necklaces all the time. The fine silk can stretch and weaken, so if you see extra space between the knots that separate the pearls from each other, which could be a sign that the necklace needs to be restrung. Brand new components are used and the clasp is replaced if necessary.